I shouldn't have updated the app today. It was working just fine till the update. It's not working at all right now. One would think when an app receives an update it would be more, not less stable. But this is Mercedes technology in all its glory! There should have been a warning with the update "if it ain't broke don't fix it" lol. Here's the message I get when trying to do anything remote with the Wagon. All I get is a perpetual spinning circle, and then finally some advertising. It's not connecting to my car at all. 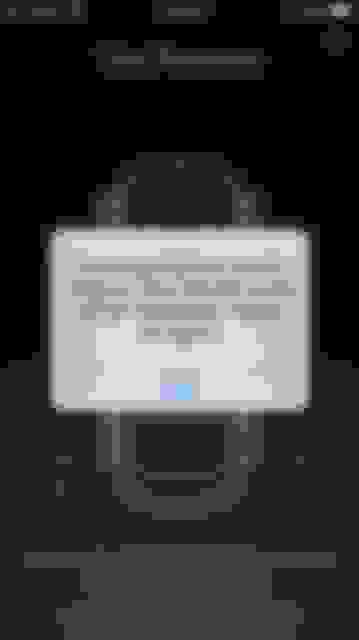 But this morning, before the update (I'm so sorry I posted an update was available), it was working just fine. Waaaaaay to go Mercedes. Harumph! Unfortunately my Mercedes Me Connect rarely connects when I need it We have had some freezing cold days below 20 this week and I really wanted to start my car in advance but unfortunately the damn app never works then.. However it always seems to be able to remind me when I didn't lock my car in my garage. I just tried and it's working again. It's the perpetual on and off and on and off app. Great. I think they are doing work on the app today. It is still a work in progress. I’m at a loss on that. I’ve literally looked into every menu and sub menu and cannot find any setting like that. You have to go to car settings, then from car setting scroll down to "Units" submenu and there you can change from imperial to metric units. Its not the car read outs that’s the issue. They’re in KMS and the Mercedes Me website shows the info in metric as well. It’s only the iPhone app that’s in imperial. There seems to be no way to change the app settings. You can try to delete the car (only from portal on your computer) and add it from your app on your phone. To be honest, I’ll leave it. The app works fine, everything it works well and I can live with a minor thing like that. I don’t fancy screwing it up by fiddling around with adding or deleting cars etc. I know what you mean, but since it decided to wake up again, it's been stable. I hope two positives don't turn this into a negative! I had similar issues with app and after that process no problems so far. In my case it worked, but it's your car so it's up to you. I've been lucky with the app I guess, no really problems once I set it up properly thru the website. Wish I could turn on heated seats with it. While I have not used the start feature, late last night I checked the system as I was approaching our car, the system asked me to confirm the new MB Me connect T's & C's (Terms and Conditions). Since we got our new 2019 CLS450, the app has worked well with no issues to report. For me an auto top up or down including windows for my E450 CAB would be a great addition to the app. Knock on wood, my app works just fine after the update....disappointed it didn't add new features; especially the pilot auto park. Ya, I'm thinking my car needs a reset at the dealer too. That must be when they start from scratch and enter in all the info. Did your app read data like tire pressure, doors open/closed, etc. Mine does that, it just will not remote start or remote unlock/lock doors. I've had a complaint into MB for a few days not as it has not worked in a month and sent them snapshots of the app on the phone but have yet to hear anything back from them, next stop is gonna be the dealer. for a month now i've been mailing with mercedes, because you can no longer send POI's (addresses) from the website, to the the POI app in the car. You look at the reviews of the app under the apple app site and the reviews are mostly horrible, lots of issues. I finally removed my Wagon from the app and re-entered the car which is going to require a trip to the dealer for them to re-verify the car. Gonna give that a try tomorrow afternoon. Still works ok on my Cabriolet although sometimes the app takes a long time to load, but I can unlock/lock and remote start that car. The wagon it's been going on a month now before the app last worked on it. I'll see what happens tomorrow. 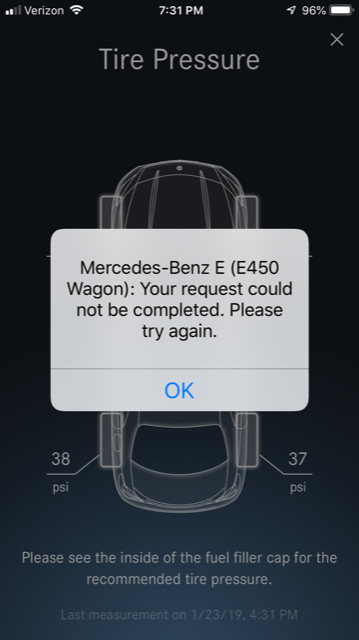 The Mercedes App people are not getting back to me even though I've called them a few times and they told me to send screen shots of what the app is doing (or not doing) and the wagon and no response. 2012, you're not doing it right. You need to call them daily and make yourself a nuisance. That's the only way I got all my Me Connect App connection issues resolved. I became an annoyance. Squeaky Wheel!